The confectionery industry is comprised of three segments: chocolate confectionery, sugar confectionery and gum products. All three categories are characterized by the use of a significant amount of sugar and sugar substitutes. Confectionery is generally low in micronutrients, but rich in calories and carbohydrates. 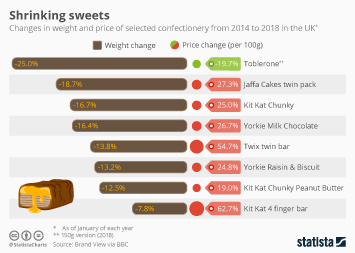 According to industry figures, the global confectionery market was led by the Western European region, based on generated sales. To address health concerns, better-for-you products have been on the rise. As a result of the demand for naturally sourced colors, the clean label trend has hit the confectionery category. In order to satisfy this growing demand, many food companies announced plans to reformulate their products to exchange artificial ingredients and simplify the ingredients lists. In the U.S. market, confectionery sales amounted to nearly 34.9 billion U.S. dollars in 2015 and are expected to reach 38.1 billion U.S. dollars by 2020. Based on retail-tracked sales for the 52 weeks ended July 8, 2017, the confectionery market in the U.S. was led by two large confectionery manufacturers: The Hershey Company and Mars. Chocolate products manufactured by Hershey include well-known brands such as Kisses and Reese’s Peanut Butter Cups. A 2017 consumer survey found that approximately 49.41 million U.S. consumers indicated that they mostly eat Snickers.